As spring approached, it was time for me to mow the lawn for the first time since the dead of winter. Pollen was all around as the trees began to awaken from their slumber and the spring flowers began to bud with colorful exuberance. However, my azalea flower bed was overrun with rogue vines growing over the top of the bushes choking the brand new budding azalea flowers. As I was pulling the weeds away to free the new azalea blooms, I couldn’t help to think about how the devil tries to do the same thing to us just when God is about to birth something brand new in our lives. That’s because the Bible says in John 10:10 that the devil comes to steal, kill, and destroy, but the Lord has come to give us life and life more abundantly. Unfortunately, if we allow the devil to have his unauthorized way in our thoughts and minds, he will definitely choke the abundant life that the Lord has come to give us, just like those rogue vines in the garden at spring time. So then how can we effectively stop the devil in his tracks on his mission to steal, kill, and destroy the abundant life that Christ paid so much to freely give us? Well, I believe one of the best ways we can do this is to pray to the Lord with a grateful heart for all that God has done for us regardless of the fiery darts of the devil intended to discourage and disappoint us in life. Philippians 4:6-7 states, “Be anxious for nothing, but in everything by prayer and supplication, with thanksgiving, let your requests be made known to God; and the peace of God, which surpasses all understanding, will guard your hearts and minds through Christ Jesus.” You see, when we cast our cares upon the Lord, with thanksgiving in our hearts, and having faith that He hears our prayers, He begins to weed out the life-choking rogue vines encroaching upon our lives by the devil so that God’s peace may fully blossom in our hearts and minds regardless of our situation. Therefore, the best weed-eater we have in our tool shed to weed whack the devil over the head is the weed-eater of an effective prayer life fueled by an abundantly grateful heart dependent upon the unsurpassing peace of Almighty God. James 5:16 states, “The effective, fervent prayer of a righteous man avails much” and 1 Thessalonians 5:16-18 tells us to, “Rejoice always, pray without ceasing, in everything give thanks; for this is the will of God in Christ Jesus for you.” So according to the Bible, it is God’s will for us that we should pray with fervency and always give thanks to Him. 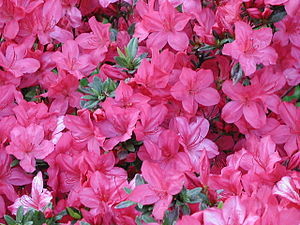 As we do, we can rest assured that God’s good plan and blessing for our lives will burst forth like the abundantly beautiful azalea blooms in spring time as a testimony to the Lord’s glory, goodness, and faithfulness. Through fervent prayer and a thankful heart, the peace of Jehovah Shalom, the Lord our Peace, will rule and reign in our hearts and minds as all of our hopes and dreams in Him eventually germinate, blossom, and come fully alive at His perfect right time! The Make It Happen Moment ® Grateful Copyright 2010, The Make It Happen Learning Institute. You have permission to reprint The Make It Happen Moment ® Grateful, in its entirety only, and forward to your colleagues and friends, provided the copyright notice remains part of the reprint and transmission. All other rights reserved.